As I mentioned a while back, Liz Williams’ Detective Inspector Chen series of novels found a new home at Morrigan Books. Therefore the small independent publishing house, Morrigan Books, scheduled for release the next two novels in Liz Williams’ series, “The Iron Khan” this December and “Morningstar” next year. But for the readers interested in Liz Williams’ “The Iron Khan” and who have an e-reader the novel is already available, because Morrigan Books released the e-book edition this week on Amazon and Smashwords. The e-book edition has an interesting cover, made by the art director of the Morrigan Books, Reece Notley, if I am not mistaken. However, since the publisher plans to release a paperback edition and a hardcover special edition we can expect a new cover for those editions too, Morrigan Books commissioned Stephanie Pui-Mun Law for the artwork which will be featured on the cover of the physical editions of “The Iron Khan”. I am looking forward to see that cover artwork too. 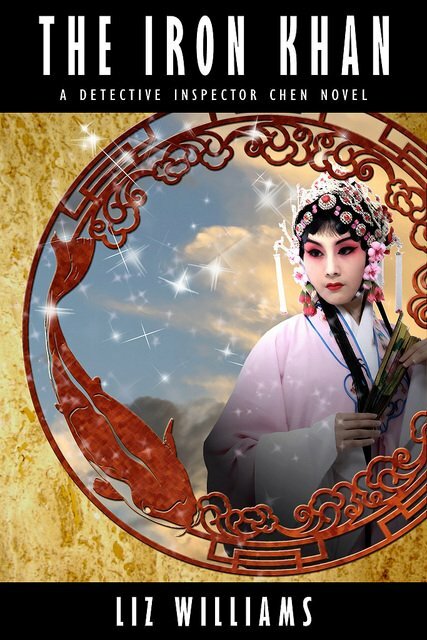 Being considered a friend to the Emperor of Heaven has its drawbacks — especially when one is Detective Inspector Chen and the Emperor needs assistance in finding the Book, a escaped, self-aware magical artifact with the power to alter the world. Tasked with retrieving the Book before it can alter reality, Chen crosses paths with his former partner, Zhu Irzh who is in hot pursuit of the Iron Khan, an evil, homicidal immortal intent on conquering Asia by any means. 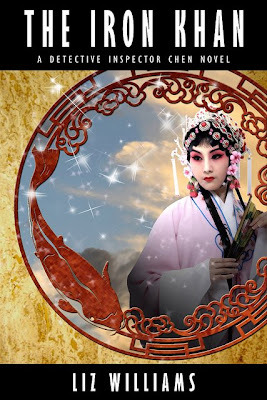 While Chen and Zhu are otherwise occupied, Inari — Chen’s demon wife — is whisked away by forces intent on revenge against Chen and ultimately, the Emperor of Heaven. The fantastical deserts of Western China and a mythical city of wonders serve as a backdrop for Chen, Zhu Irzh and Zhu’s lover, Jhai Tserai as they wage an intense, personal war to prevent their worlds from a cataclysmic destruction. Liz Williams delivers an exotic tapestry of unique urban fantasy — rich with Asian mythology and interesting, fully-formed characters. From the quirky inclusion of a taciturn badger teapot to the luxurious descriptions of Singapore Three, Williams crafts a solid and fantastical world like no other writer in the fantasy genre. Strong storytelling and unexpected plot twists is guaranteed to keep the reader intrigued…and longing for more. Well I'm definitely not a fan of that cover, but that is one hell of a blurb. Really? I actually like the cover art. I think it looks magical.